Pat Lipsky began exhibiting in New York in the late 1960s at André Emmerich Gallery, working in the prevailing mode of gestural abstraction. 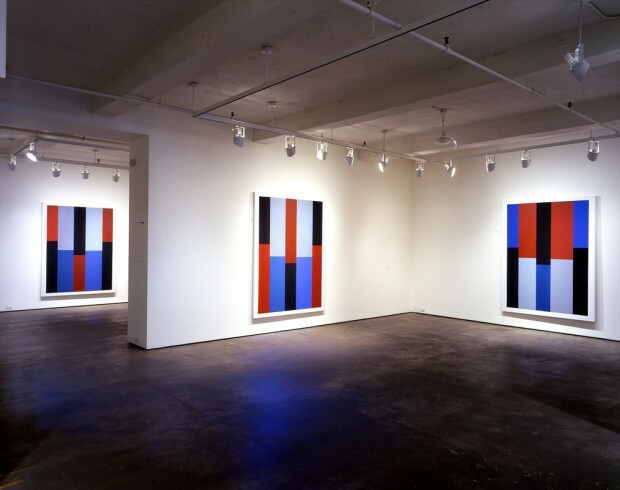 Over the last couple of decades (she stopped showing regularly between the late ’70s and late ’80s), her work has evolved into a geometric abstraction that features a shallow space composed of overlapping rectangles of various flat colors. Because the rectangles are made freehand, and the colors are arrived at through a patient buildup of successive coats of paint, a subtle gestural quality has been retained, animating the paintings far more than what we’ve come to expect from Minimalist or Neo-Gee art. In an era when so much of this stuff is apparently graphed-out on software programs and executed by squadrons of assistants, one gets the sure sense of Lipsky’s painting being a one-woman operation once the canvas is primed, and its animate spirit the result of a human body determining the scale of the paintings and making them with a deliberateness and persistence that doesn’t rely on tape to find an edge. But this show was also her most successful in not overplaying the Romantic spirit of her residual gesturalism and elusive color. Collectively titled “Red River Valley,” Lipsky’s new paintings are all vertical rectangles with squared-out proportions. The compositions are ingeniously programmatic: a small border frames an embedded rectangle that is subdivided into five even vertical bands that are in turn horizontally divided into two interior rectangles of their own. The second and fourth bands are wider than other three other bands, and the horizons within each band alternate at higher and lower elevations. The colors also alternate in roughly corresponding pairs and triads, a pair to each band, the same pair to alternating even and odd bands. There are five general categories of color: red, blue, black, gray and white. Modulations of these colors can occur within an individual painting as a variation in light or mood. The broken horizon creates different sensations of near and far, night and day, even shifts in weather, which each panting recombines to an overall effect and a resolute abstractness. Or maybe not so resolute. The clean form of pure abstraction is there, but that undulating horizon draws you into a narrative space. And while Lipsky’s colors don’t evoke the natural world, their mixed-down quality, like a gray scrim, certainly evokes the world of experience, a lived-in-ness. And they remain the colors of signs, thereby recalling urban, graphic-infused vertical spaces augmented by the sudden deep spaces found in the stark horizons of extreme nature, the oceans and deserts. Lipsky’s classicalism is ultimately idiosyncratic in the best sense. Looking at these large, basically geometric paintings I kept thinking unexpectedly of Guston, who used these colors and repeatedly opened a theatrical, narrative space in the backdrop of a simple horizon. Lipsky’s hand-painted edges and the sweet smell of oil paint that had subtly impregnated the gallery were the only echoes of Guston’s painterliness. Guston meeting Reinhardt, then; a synthesis that, however full of painting culture, feels just right in our present moment.